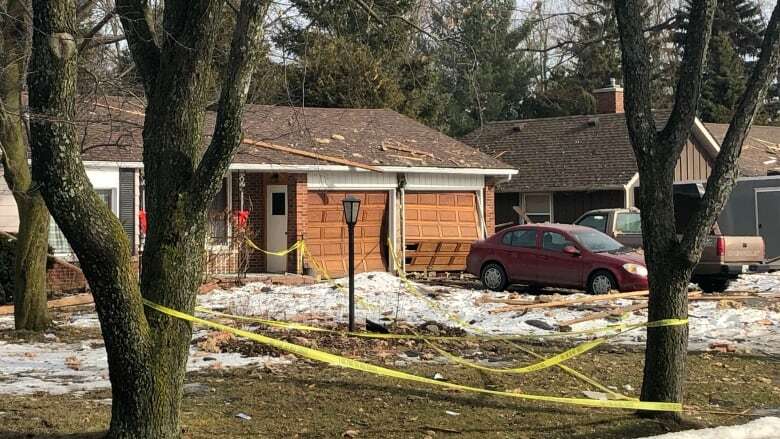 Ontario's Office of the Fire Marshal is investigating the extent of the damage to homes after a weekend house explosion in the town of Caledon left one man dead and up to 35 residents displaced. 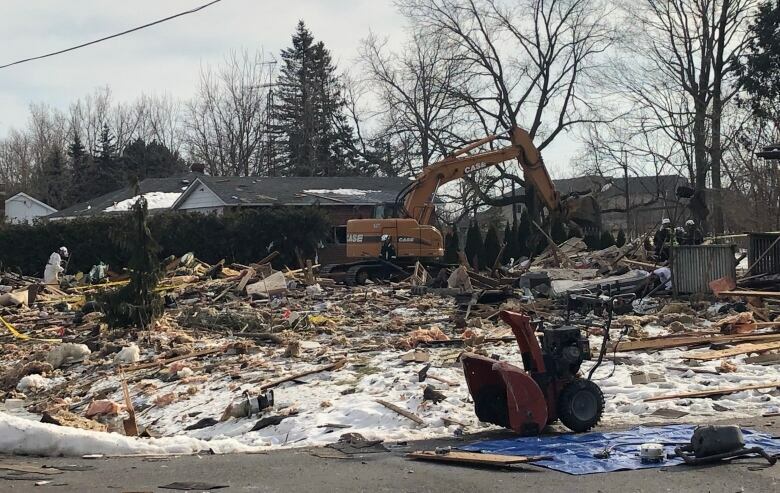 Ontario's Office of the Fire Marshal is investigating the extent of the damage after a weekend house explosion in the town of Caledon left one man dead and up to 35 residents displaced. It's still not clear what caused the explosion or when residents forced out of their homes by the blast will be allowed to return home. "Our debris field is very large and we need to document that as thoroughly and accurately as possible," Andrea Gaynor, an investigator with Ontario's Office of the Fire Marshal, told reporters near the scene on Monday. Sunday's early morning explosion on Maple Grove Road killed one man identified as Joseph Westcott, 54. Fire crews evacuated an area surrounding the blast immediately afterwards. No one else was injured. Police say Westcott was alone at the time. Gaynor said crews are going to every home in the evacuated area to document damage. "Sometimes, you will see us on our hands and knees going through areas because we don't want disrupt certain areas. And other times, we are able to use the heavy equipment to remove large items." No causes have been ruled out, she added. A drone will survey the area on Monday, taking the radius of the debris field. Likely this week, it's expected that the damaged homes will be released to the town to allow structural engineers and insurance companies to make assessments. That doesn't mean the residents are going back, she said. Residents will go back when it is safe, she added. "We don't want to displace these people any longer than is absolutely necessary," Gaynor said. At least seven to nine homes sustained significant damage, she said. An estimated 22 homes were damaged in all. 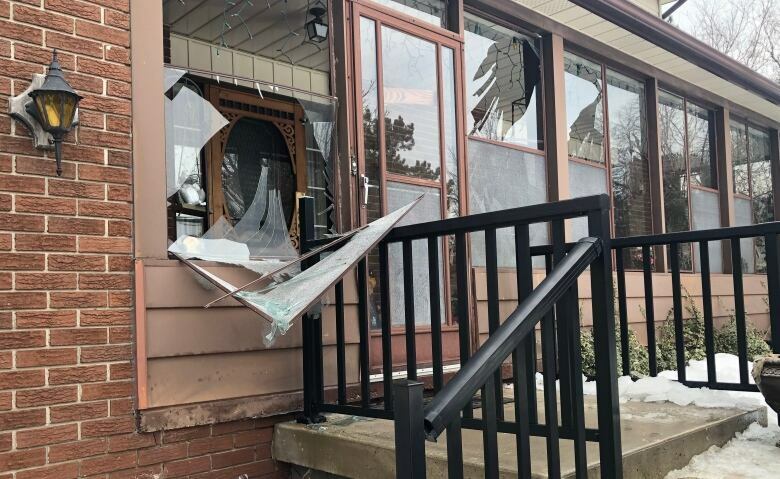 Some have structural damage, while others have broken windows, she said. Structural damage includes walls that have shifted and roofs that were lifted up and dropped back down. Gaynor described the blast as an "high order explosion," which means the blast pressure wave from the explosion was more than 1,000 metres per second. That explains the fracturing and splintering of the house that exploded and the very large debris field, she added. Crews have been using an excavator to sift through debris at the property where the explosion occurred. Crews have also spread out a tarp to create a grid as they investigate. "We will be 'de-layering' that scene and we will be looking for all the fuel delivery system components," she said. Some components could be taken back to the OFM's laboratory in Midhurst, Ont. An expert at the lab will be able to examine the pieces to determine if damage was caused before or as a result of the explosion. Gaynor said crews will also look at all appliances that were powered by fuel in the home that exploded; including the furnace, hot water tank and barbecue. "That's going to be key in determining the cause here," Gaynor said. Investigators do not know whether the explosion was accidental or not, she added. After the blast on Sunday, Caledon Fire Chief Darryl Bailey said the gas main was "free flowing" when crews arrived at the demolished home. Bailey said on Monday that the fire department will meet with displaced residents to talk about the process that will be followed to get them back in their homes. "There is no schedule as to when they will be allowed back into their residences," he said. Bailey said gas and electricity have been shut off to homes in the evacuation zone. Mayor Allan Thompson said in an interview with CBC Toronto on Monday that he hopes displaced residents will be able to retrieve their vehicles from the evacuated area soon after crews have removed debris and cleared roads. 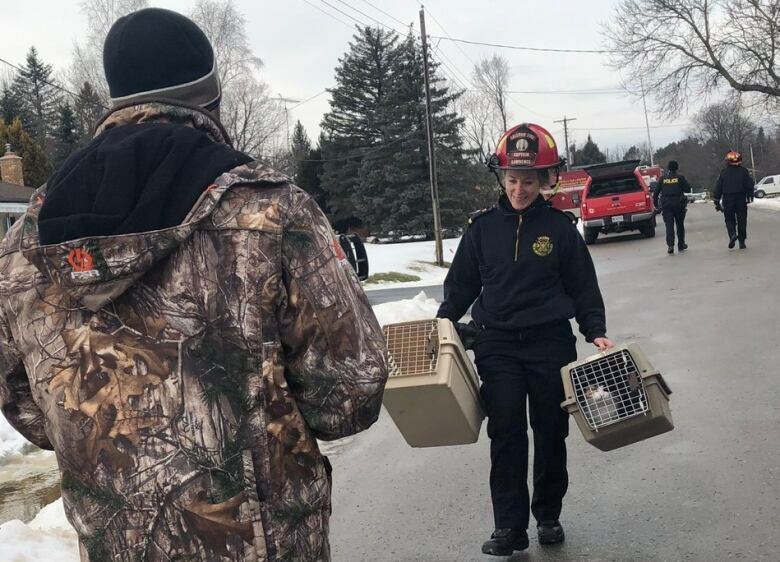 Some cats were left behind as residents left in a rush, but all pets have now been accounted for, he said. On Monday, cats were reunited with their owners.